Last week, we visited the Georgia O'Keeffe Museum in Santa Fe, New Mexico. We visit Santa Fe fairly often, as it's only about an hour's drive from Albuquerque, but we had never visited the O'Keeffe Museum before. It's near the Plaza area where so many of the main attractions of Santa Fe can be seen, but far enough away, on a quiet side street, to feel a bit removed from the tourism and bustle, sheltered from it, even. That was one thing I really liked about it; there was a peacefulness, a calmness to set the stage for viewing art. This is a photo-heavy post but I don't think there is any other way to share something so visual. Georgia O'Keeffe, here seen in a photo on display in the museum, was an American painter who made significant contributions to the American Modernism movement. O'Keeffe was born in 1887 in Wisconsin. She studied at the Art Institute of Chicago, learning the techniques of realist painting. Later, her work became much more abstract, and she sent some pieces to a friend, photographer Alfred Stieglitz, who was the first to exhibit her work in 1916 (he later became her husband). O'Keeffe's early abstract work included paintings of skyscrapers and flowers. In 1929, O'Keeffe made her first visit to New Mexico, where she found much inspiration in the desert landscape. By 1949, after Stieglitz's death, she made her permanent home here. O'Keeffe also traveled internationally, drawing inspiration from locales all over the world. As she aged, O'Keeffe suffered from macular degeneration but persisted in painting even when nearly blind. She died in Santa Fe in 1986, at the age of 98. The museum is just one part of O'Keeffe's legacy in New Mexico; visitors can also tour her home and studio in Abiquiu, on the Chama River, about 50 miles northwest of Santa Fe. This site is considered a national historic landmark and one of the most important artistic sites in the United States. 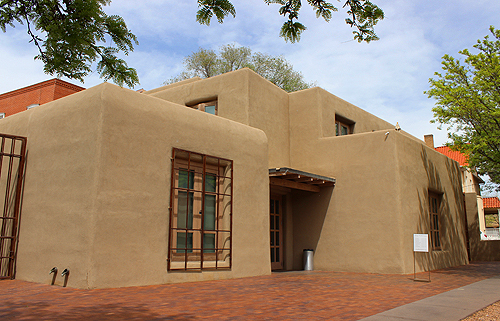 There is also a research center located near the museum in Santa Fe. We visited the museum early on a Tuesday morning, just after it had opened for the day. I wasn't sure what to expect, especially since we were visiting with children. Santa Fe is renowned for its many art galleries, filled with intriguing paintings and sculpture, but these are not necessarily the best places for kids. The O'Keeffe Museum was very family-friendly. Though on the small side, its layout is open and airy, with plenty of room to spread out. This was a perfect time of day to visit; it was quiet and not yet busy, and we could stop and look at everything for as long as we wanted. The children's admission was free, as it is for all students age 17 and under. New Mexico residents pay $8 each, which is four dollars less than the general admission price. So our family was admitted for a total of $16, which is very reasonable as museums go, I think. Upon admission, children are given, on loan, a sketchbook, pencil and small photo book containing instructions for an interactive tour of the museum. You can also download a tour app for both iOS and Android devices with audio, text and video components but we did not do this. We were happy to use the museum's family materials this time around. There is a short film about O'Keeffe played on loop near the museum's entrance, which we did watch and enjoy. The family activity guide was really helpful and made the visit much more interesting. Visitors, especially young ones, are encouraged to stop and consider the paintings carefully, thinking about why O'Keeffe chose her various subjects, what she saw in them or thought about them, why she painted them the way she did. As a parent, and as a former teacher who often found museum tours a bit tricky with her students, I really appreciated this approach to family museum touring. We made our way through the different "rooms" of the museum, sort of a winding maze culminating in a huge, light-filled gallery devoted to O'Keeffe's New Mexico-inspired works. The activity guide encouraged children to sketch what they were seeing; the GB, the more artistic of the pair, embraced this enthusiastically. She sketched many of the paintings she saw, and even some of the photographs. Included in the exhibits is a small collection of Stieglitz's photography; O'Keeffe and Stieglitz had a very intricate artistic relationship in addition to their personal one. These are some of my favorite paintings from O'Keeffe's vast series of floral art. The museum's collection is fairly extensive, and I really enjoyed the way the paintings were displayed, in very simple frames on clean, white walls with a fair amount of natural light. Some parts of the museum are darker, with photography prohibited, because they contain exhibits of delicate watercolor paintings. The New Mexico collection was my favorite part of all. I was so enthralled, I didn't take very many photos, but it's fantastic. The collection is in a huge, open room, as I mentioned above, with lots of natural light from skylights. I loved seeing O'Keeffe's paintings of the high-desert landscapes, including mountains, wide-open plains and desert plants. I especially loved these two paintings, the horse skull and thigh bone. Animal bones are a fact of desert life, especially around Abiquiu and Ghost Ranch, where O'Keeffe did so much of her painting. There are many other interesting features in the museum, aside from O'Keeffe's own paintings. I particularly enjoyed seeing photos of her at home in Abiquiu (such as the photo near the beginning of my post, which was taken in 1960, when she was in her seventies; she was working at her table, preparing homegrown greens for salad). I thought this was a wonderful exhibit. It's a live video feed, shown on a television screen, of O'Keeffe's garden at her home in Abiquiu, which is now maintained as a historic site, as I mentioned above. The feed runs all year and you could, if you visited the museum often, watch the plants grow in her large and well-planned gardens at the home. As it was early in the growing season, especially in high-altitude Abiquiu, there wasn't yet a lot to see when we visited the museum, but I have a feeling it must be quite lush by August, after the monsoon has settled in. I also enjoyed some small exhibits of O'Keeffe's personal belongings, in glass cases near the New Mexico room. This is a display of O'Keeffe's "travel boxes," which are filled with souvenirs, photos and brochures from places she visited around the world during her period of international travel, which happened fairly late in her life. And this is a collection of art materials that she used in her studio, including an artist's case, brushes, tubes of oil paint and other chemicals and tools useful to a painter. It was lovely to see her art supplies, which are cared-for and tidy. Actually, the tidiness of them seems a bit at odds with the dramatic nature of her work, doesn't it? I'm not sure what her studio is like, but I'm even more intrigued to see it now. We were really glad to have taken the time to visit the O'Keeffe Museum as we passed through Santa Fe on our way to Colorado. The GB was especially happy to see O'Keeffe's work, as she spent a lot of time studying it this year in school. I'm proud to know there is such a lovely museum devoted to O'Keeffe's work, right here in a place that inspired her and that she came to love so much. If you're ever in Santa Fe, I think this museum is a must-see. 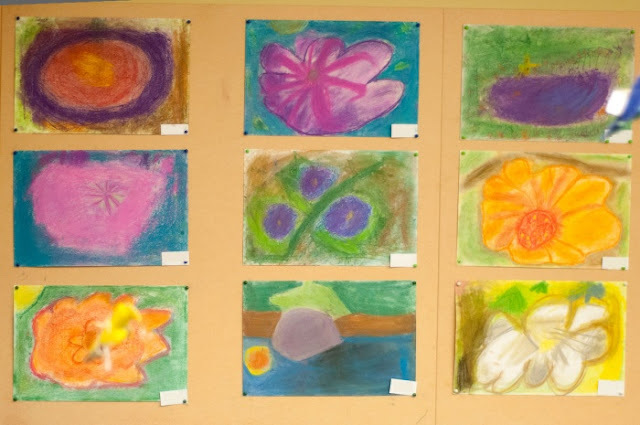 Before I go, do you remember when I mentioned awhile back that the GB's class had created their own O'Keeffe-inspired florals in chalk pastel? Here are some of them. The Bear took these photos at our school's annual art-and-poetry exhibition, held in December just before the holidays. They were based on photos the Bear took himself, to help the teacher provide visuals for the children, of flowers around our neighborhood (you can see the photos in the post linked in the text above). Aren't the drawings wonderful? These were done by children in kindergarten through third grade, or about five to nine years old. The GB's drawing is in the upper photo, in the top left corner. Hers is a drawing of Russian sage flowers. 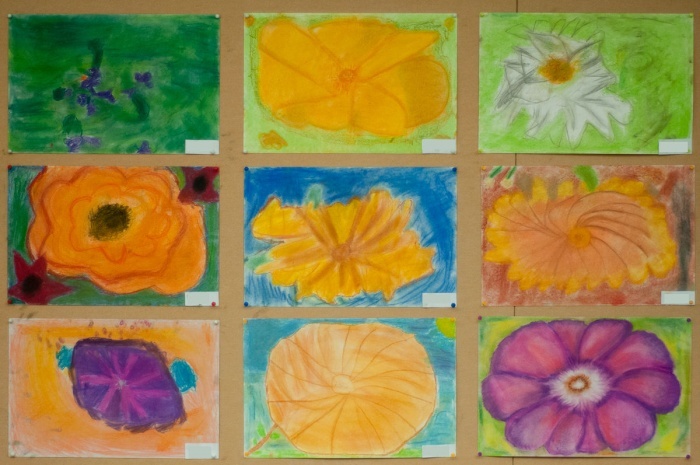 O'Keeffe's work became very important to these children over the past year. I meant to show you these drawings sooner but it slipped my mind. I'm proud to have the GB's Russian sage flowers, now laminated for protection and cleanliness, displayed on the kids' art-gallery wall in our home. I know she's proud of her work and I hope she will always hold on to a little inspiration from Georgia O'Keeffe. What a wonderful museum. As you may know, I love O'Keefe and her work. I would love to visit. It reminds me of Barbara Hepworth's museum here in St Ives. That looks like a fun museum to visit, and I love the guides you can use. She was very talented! What a great tour of the museum and since I think it's highly unlikely I'll ever have the chance to visit, I really appreciate you sharing it with us. I had only seen one or two of her paintings before, so this was a real treat. I love the GB's painting. She is showing lots of talent and how wonderful to see the works of art in person that she studied in school. That always brings new meaning to the subjects we study. You certainly gave us a wonderful tour, an inspirational gallery and I just loved how they had made it so child friendly. GB has a real talent for art. Take care. What an interesting read. Thank you for introducing me to such an inspiring artist. How wonderful that you can visit the place where she lived and some of the areas that were an inspiration to her. Thank you for sharing. I loved visiting the museum a couple of years ago. It was a hot, quiet day and not many visitors. I always like seeing real life pictures and personal items. Would love to visit her home/studio one day. Love the O'Keefe inspired drawings the children did. Very pretty! I have always loved the bright,bold colors she used! Looks like a wonderful museum. I loved reading about your visit. O'Keefe is in the arts pages here as there is a major retrospective of her work opening next week at Tate Modern in London. Like CJ I would be so interested in visiting her garden. Great artwork too - I remember when my children painted in the style of Georgia - they were fabulous paintings because her use of colour and boldness of stroke is so good to emulate. Hi Jennifer! What a wonderful learning outing! I love the children's renditions! What a fantastic post, friend! I can't tell you how much I love this post! I am a huge fan of Georgia O'Keeffe and I've always wanted to visit Santa Fe (and Taos). And because you're such a wonderful photographer and writer, this piece was perfect for me to get my fix of the artist and a little of Santa Fe. This piece could easily be in a tourism book or guide of your area! PS - the children's artwork is amazing. Thank you for sharing! Thanks for sharing, I didn't know too much about O'Keeffe, so it was good to find out more. I liked Belladonna best out of the paintings you showed. The children's artwork is super too. An amazing adventure. I have seen an exhibit of her work but have never been to that museum, what a treat! I've always wanted to visit the Georgia O'Keefe museum! Thanks for sharing your pictures, it looks like a wonderful family trip. And have a great 4th of July! the chalk florals are just lovely. Great home schooling activitiy!! !